Location: Biddeford, Maine • Date: 1/10/11 • Standard Print (w & h): Image: 28.0" x 50.7.0"
This image of a sun rise over the Saco River is composed of 15 individual shots taken at 165mm. 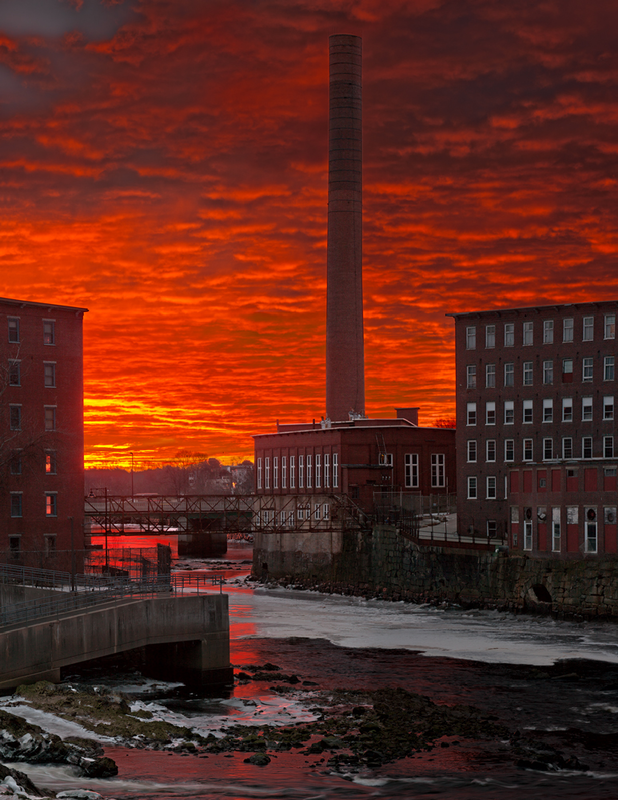 I had wanted to get a sun rise over the mills in Biddeford/Saco for a while, and on this cold January morning I went out to shoot one. I looked at a number of places before settling on this vantage point, which despite the way it looks, is in Biddeford, not Saco. Preferring dawn shots over those of actual sun rises, I had gotten some images, packed up to go and was walking back to the car when I heard a noise and turned around to see this sight. Needless-to-say I got set up in a hurry and managed to get these shots before the whole scene disappeared a moment or two later.